Effigy of Lady Arundel in the FitzAlan Chapel, St. Nicholas, Arundel Castle, Sussex, England – redone by TudorQueen6. Joan FitzAlan, Countess of Arundel (before 2 November 1424-before 9 September 1462) (born Lady Joan Neville) was the eldest daughter out of the six daughters of Sir Richard, 5th Earl of Salisbury and Lady Alice Montacute, suo jure 5th Countess of Salisbury [Countess in her own right]. Alice was the granddaughter of Lady Alice FitzAlan, Countess of Kent; daughter of Sir Richard “Copped Hat”, 10th Earl of Arundel and Lady Eleanor of Lancaster. Joan was most likely born at her mother’s principal manor in Wessex. The Salisbury’s had ten children which included Richard Neville, 16th Earl of Warwick, known as ‘Warwick, the Kingmaker’; John, 1st Marquess of Montague; Lady Cecily, Duchess of Warwick; Lady Alice, Baroness FitzHugh; Lady Katherine, Baroness Hastings; and Lady Margaret, Countess of Oxford. Joan’s family was one of the oldest and most powerful families of the North. They had a long standing tradition of military service and a reputation for seeking power at the cost of the loyalty to the crown as was demonstrated by her brother, the Earl of Warwick. Warwick was the wealthiest and most powerful English peer of his age, with political connections that went beyond the country’s borders. One of the main protagonists in the Wars of the Roses, he was instrumental in the deposition of two kings, a fact which later earned him his epithet of “Kingmaker”. Joan and her siblings would visit their grandmother, Lady Joan Beaufort, Countess of Westmorland [daughter of Prince John of Gaunt, 1st Earl of Lancaster and Katherine Swynford], often at her manors in Middleham and Sheriff Hutton. After 1440, her father inherited the manors and Joan and her siblings began living in the manors on a more permanent basis. At and early age Joan started lessons in Latin and French with an introduction to law and mathematics. Joan would begin every day by attending mass with her family. As the tradition of most nobility of the times, the parents were absent attending to the King’s matters or personal business. They only saw each other on special occasions. Arundel Castle and surrounding town in 1644. Lady Joan married her 3rd cousin, William FitzAlan, 16th Earl of Arundel, sometime after 17 August 1438. After she married, Joan spent most of her adult life at Arundel Castle in Sussex where the Earls were seated. Arundel was the son of John FitzAlan, 13th Earl of Arundel and Eleanor Berkeley. His mother was a daughter of John Berkeley and Elizabeth Betteshorne, granddaughter of Thomas de Berkeley, 3rd Baron Berkeley and his second wife Catherine Clivedon. Through Arundel’s great-grandfather, the 1st Lord Arundel, came the inheritance of the Earldom of Arundel. It passed to Lord Arundel’s grandson, John [13th Earl], upon the death of his cousin, Thomas FitzAlan, the 12th Earl. Arundel was a direct descendant of King Henry II and Eleanor of Aquitaine; King Henry III and Eleanor of Provence; King Edward I and Eleanor of Castile; and others. William fought in the Second Battle of St Albans (22 February 1461) as a supporter of the House of York. The Yorkists were commanded by his brother-in-law Richard Neville, 16th Earl of Warwick. Edward IV of England named him a Knight of the Garter in 1471, probably in honour of his support during the Wars of the Roses. He was Warden of the Cinque Ports in 1471 and from 1483 to 1488. After Joan’s death in 1462 he largely retired from public life. Thomas, Lord Maltravers (23 November 1417–1487) who succeeded his father as the 17th Earl of Arundel. He was godfather to Prince Arthur of Wales, son of Henry VII and Elizabeth of York. Thomas married to Lady Mary Woodville, sister of queen consort Elizabeth Woodville [wife to Edward IV.] They had issue which included William, 18th Earl of Arundel. Joan’s sister was Alice, Lady FitzHugh, great-grandmother to Queen Katherine Parr. The FitzHugh’s were related to the FitzAlan family through the 4th Lord FitzHugh’s wife, Hon. Margaret Willoughby, who was a great-granddaughter of Sir Edmund, 9th Earl of Arundel. The Neville’s were also descendants of Sir Richard, the 8th Earl who’s daughter, Eleanor, married Sir Henry Percy, 9th Baron Percy. Joan’s mother, Alice, also descended from the FitzAlan family being the granddaughter of Lady Alice FitzAlan [see intro]. David Baldwin. The Kingmaker’s Sisters: Six Powerful Women in The War of the Roses, Gloucestershire: The History Press, 2009. Linda Porter. Katherine the Queen; The Remarkable Life of Katherine Parr, the Last Wife of Henry VIII. Macmillan, 2010. Douglas Richardson. Magna Carta Ancestry: A Study in Colonial and Medieval Families, 2nd Edition, 2011. This entry was posted in The Family of Katherine Parr and tagged 16th Earl of Arundel, 17th Earl of Arundel, Countess of Arundel, Earl of Arundel, Earl of Salisbury, Joan Neville, Neville, Salisbury's daughter, Sister of Warwick, The Kingmaker's sister, Warwick the Kingmaker, Warwick's sister by tudorqueen6. Bookmark the permalink. Great post, Meg! Wow, this effigy is really beautiful! Thanks Sylwia, I was lucky enough to find pictures of the full effigy. Wish I could find another of her face. 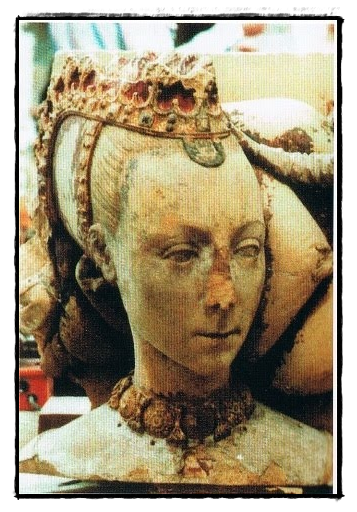 It’s funny, I posted her effigy [of her head] on the CP page under Noble Relations and before I even put up her label people were thinking she was of another nationality, French or Burgundy, and that her headdress obviously meant she was “clearly highly born.” Ha, proving how “highly born” Katherine’s ancestors truly were. Exactly! She looks a lot like a French or Burgundian noblewoman. I’ve just recently developed interest in effigies, and this one is the most beautiful I’ve seen so far. Great!